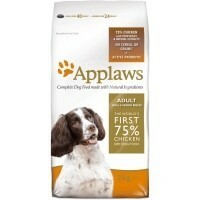 Applaws Small/Medium Breed Adult Dry Dog Food (Chicken) has been carefully formulated to help support the health and wellbeing of small and medium breed adult dogs. Made with 75% protein-rich chicken and 100% grain free, the food is low in carbohydrates and encourages the development of lean muscle and promotes a healthy weight for your dog. All of the Applaws dog food varieties are an excellent dog food . They are safe for our dogs I have researched dog food for the last 2 years , when I heard about the poison BHA & BHT which is in so many of the dog foods and would encourage everybody who owns & loves their dog to PLEASE stay away from the foods that say on the side of the packets - EC PERMITTED ADDITIVES . If you have a dog who has cancer , liver or kidney failure or has strokes , CHECK THE FOOD , FOR THE LOVE OF OUR PETS ! I also have two staffordshire bull terriers. My female has just been diagnosed with irritable bowel disease so sadly I had to stop feeding her this as she needs a special diet. However, Bruno my male has never looked so good - his red fur looks incredible now, so thick and so glossy, his muscle tone is splendid since going on this food and his teeth are perfect. People have been stopping in the street to comment on his condition, he just looks incredible. It sounds pricey at first, but you need to use a lot less of it because it's so high quality so I think it works out cheaper than a lot of other premium brands. I've tried A LOT of good quality kibble with my two fusspots & this I think, is the best so far.